The sonnets below first appeared in the TLS in 1976. The first two of five linked poems, the selection was published with some additions as part of Abba Abba in 1977. The headnote from the TLS, below, is possibly by Burgess, and it has never been reprinted. Burgess was not the first or only person who tried to put Belli into English. Harold Norse published English translations of Belli in 1960, 1966 and 1974, copies of which are in the Burgess collections in Manchester; and Robert Garioch translated some of Belli’s sonnets into Scots, with rather mixed results. 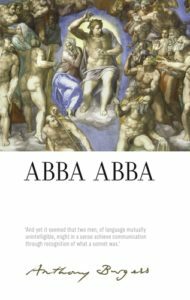 Edwin Morgan reviewed Abba Abba in the TLS on 3 June 1977, and described Burgess’s versions of Belli as ‘English tinged here and there with Manchester dialect. The translations are pungent and ingenious: fairly free as regards added detail, or local and modern analogy, but very properly sticking to the Petrarchan rhyme scheme which permits some finely strained and inventive collocations.’ By ‘pungent’, Morgan may have meant ‘extremely rude’. Giuseppe Gioacchino Belli (1791-1863) was the author of a series of over 2000 sonnets in popular Roman speech, which were not published during his lifetime: the first reasonably complete edition appeared some twenty years after his death. An excellent introductory essay on his work, making apt comparisons with Gogol and Joyce, can be found in Eleanor Clark’s Rome and a Villa. “Ave,” he said, and after that, “Maria. It was therefore a matter of some urgency. But any port will do in an emergency. Found his dry stalk was bursting into bud.